A slightly belated Halloween post. Had a busy 2 weeks, travelling so much. 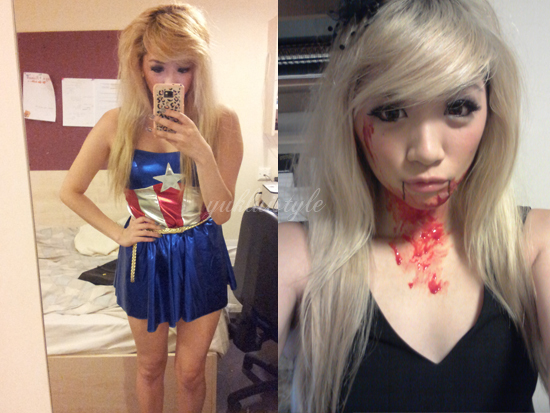 I had dressed up as Captain America and a blooded doll puppet. The Captain America was a bit big on me so I had to purchase a gold belt for it. Did the trick! Then dressed up as a blooded puppet on the actual Halloween night. Just wore a plain black playsuit with a clip on hair top hat fascinator. It was a terrible night in the end. What did you dressed up as? How did you get your hair so volumised for the captain America look?